Normally, everything that went down last time would have meant the end of the arc. The Fusion Fighters defeated Twilight, Beelzemon defeated Laylamon, and Mikey was at least able to make Ewan begin to doubt all of the lies he had been told. It's a good time for everyone to retreat to their corner, heal their wounds and determine where to go next. Unfortunately, even with so few pieces still capable and willing to fight, the rules of the game still apply and nobody's getting back to Bright Land until either Mikey or Ewan is dead. It's a grim scenario, and one that affects the bad guys as much as the Fusion Fighters. It's one thing to have Wisemon probing Mikey for a solution or Christopher and Nene searching for Ewan. Damemon is in awful shape. He's trying to maintain the facade even as his injuries make it hard for him to even walk. Ewan is buying the facade only because he wouldn't be able to live with himself otherwise. It's never stated outright, but it's clear he's thinking about forfeiting the game, even knowing what that would entail. When things really go to hell, SkullKnightmon is less concerned with his grand strategy and more focused on protecting Ewan and finding a way out. Apollomon is the only one left hellbent on destruction, and that's probably the Whispered program more than any actual feelings. Despite the role she ends up playing, Laylamon did not go in hellbent on destruction. She and Blastmon have an odd story arc this season- mostly invisible, mostly joke characters that take a serious turn when they lament being mostly invisible jokes. They're relegated so far down the ranks when the Dark Generals emerge that it's easy to forget they were two of the primary villains in the first half. Now they finally get a chance to shine again, against an opponent Laylamon has serious beef with, and they're unable to get the job done. They're left alone, disheartened and left for dead. They leap at Apollomon Whispered's opportunity because they have nothing left to lose and a score left to settle. They even welcome their forced digifuse, not because they actually like working together, but because they're all they have left. Their digifuse is strong enough to swallow up all of Underworld, which makes ending the game a priority. The probing process looks rough, and even as Wisemon has a solution that doesn't involve anyone dying, it's still awfully morbid and terribly risky. The series does a lot of growing up in this arc, and the dub doesn't dance around the subject matter. Even worse is when it comes time to do the actual procedure and Mikey is given a 50/50 chance of dying. Plenty of characters, including Mikey, have done similarly dangerous things in the past. Never were they given the odds and asked to make an informed decision. While it's ultimately successful, of course, it looks plenty painful and a long time passes before Mikey finally wakes up. Beelzemon knew his odds were far worse. It's hard to say he was even braver. He knew he wasn't going to survive, so engaging Evilbeast Laylamon was an easy decision for him, especially when it came with the opportunity to finally avenge his temple brethren. This is why it was so crucial to introduce this sudden relationship with Mervamon. Abrupt as this may have been, with everybody else occupied, it offered someone to tell him to stop, and someone to accompany him when he refused to listen. 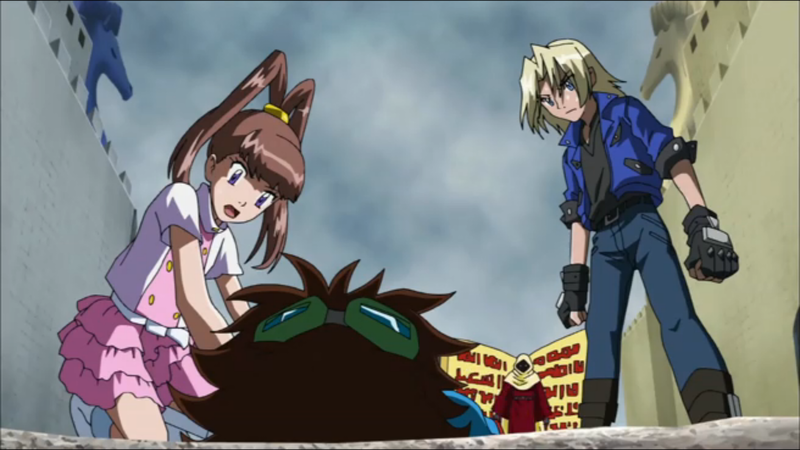 She and Cutemon had the best idea of how bad his condition was, and they stood by him as he gave his life up. Mervamon also represented a central figure to mourn his loss, an important symbol of heartbreak for a death that seemed so inevitable. Beelzemon drops the old “just a flesh wound” line. Trite as it is, it adds a certain bravado as it's hard to tell if Mervamon actually believes him. 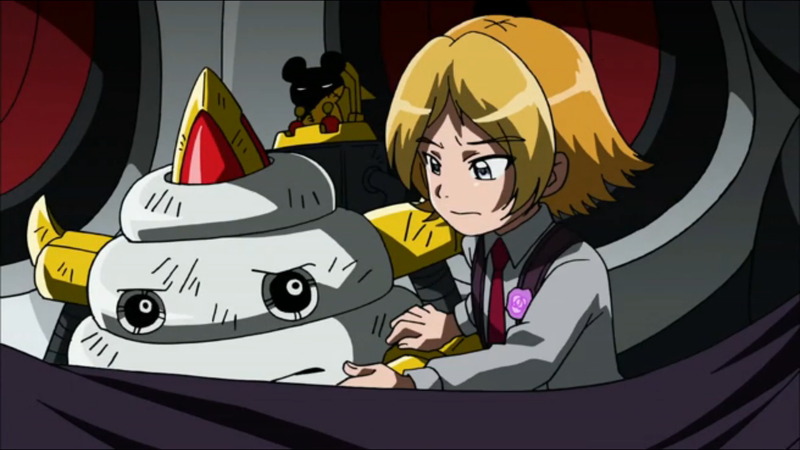 Either way, even Shoutmon and Cutemon start to wonder about HiTsundereMervamon. If there was ever a better sign of not caring anymore, Blastmon kills the Vilemon only because they were annoying Laylamon. If there was ever a better sign that even the bad guys are worn out from this place, Ewan insists on keeping Axemon in his Fusion Loader until he's healed rather than pull him out and risk further injury. Blink and you might miss him, but was that Shoutmon X3 saving Beelzemon? It's kinda cool how even this late in the series, all of Shoutmon's forms are popping out at various points. While so much of the focus is on Beelzemon and Mervamon, how about Cutemon sticking with them and trying to do his job in such rough conditions? Brave little boy, that one. Hey kids! This Saturday is Odaiba Day and with a Digimon Festival happening in Japan, we're expecting more information about Tri. I'll be doing a livestream starting at 12:00 pm Eastern Time, where we'll break down what we learn, answer questions, show clips on request, and anything else related to Digimon that you want to discuss! Check it out! Did Blastmon kill the Vilemon in the dub? Huh, in the sub they died because they tried to pull Lilithmon out of the lava. Strange thing, that.